“Bagyong MARING” will continue to enhance the Southwest Monsoon (#Habagat) that will bring moderate to occasionally heavy rainshowers and thunderstorms over the western section of Luzon, PAGASA said in a weather forecast issued at 11:00 AM today, August 18, 2013. Weather bureau said that Typhoon “MARING” has maintained its strength as it moves in an eastward direction over the past six hours. PAGASA said that location of center as 10:00 AM today was estimated based on all available data at 540 km East of Itbayat, Batanes (20.4°N, 127.7°E). Typhoon Maring has a maximum winds of 55 kph near the center. 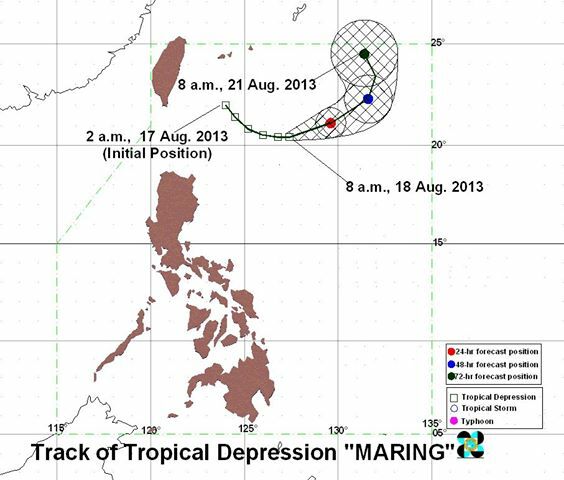 PAGASA forecast for 'MaringPH' track is it will move East Northeast at 9 kph. Tropical Depression “MARING” is expected to be at 710 km East of Itbayat, Batanes tomorrow morning and at 910 km Northeast of Itbayat, Batanes by Tuesday morning. By Wednesday morning, it is expected to be at 940 km Northeast of Itbayat, Batanes. In a rainfall advisory issued at 10:25 AM today, moderate to heavy rains due to SW (‪#‎Habagat‬) Monsoon is affecting portions of Bataan, Zambales, Bulacan, Pampanga, Rizal and Quezon and most likely to continue for the next 3hours. Fishermen specially those using small seacrafts are advised not to venture out over the seaboards of Northern and Central Luzon, Cavite, Mindoro Occidental and the western coast of Batangas due to the possible big waves generated by the enhance Southwest Monsoon.